The sitter wears a black hat, a white shirt, and a dark gray garment tending towards a steely blue. He has brown hair, brown eyes, grayish black eyebrows, and a brownish complexion with pink cheeks and pink on the nose and chin, and reddish lips; his hands are also reddish. The letter is white with the slightest suggestion of a pink seal at the lower right covered by a triangle of paper; the writing is brown. Background olive green, visible also at the lower left and right. PROVENANCE: London, Colnaghi’s, 1965; Howard A. Dawes, Birtsmorton Court, Worcestershire. Bought by the National Gallery, November 2000. Paintings by Old Masters, London, P. & D. Colnaghi & Co. Ltd., 20 May – 11 June 1965, no. 7, Pl. 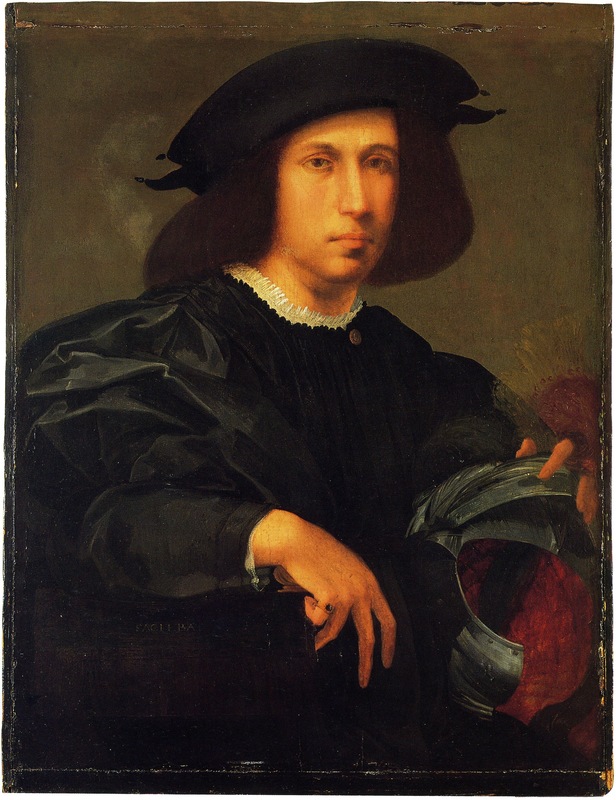 V, with an attribution to Rosso supported by comparisons with his Portrait of a Man with a Helmet in Liverpool [Fig.P.16a] and his Portrait of a Young Man in Washington, D.C. [Fig.P.8a]; the year on the letter noted as 1518. Mentioned by Benedict Nicolson, BM, CVII, 1965, 330, as by Rosso, with the date 1518, and as related to the portrait in Liverpool. Costamagna and Fabre, 1986, II, 415. Franklin, “Portrait,” 1989, 839, Fig. 40, as Rosso. 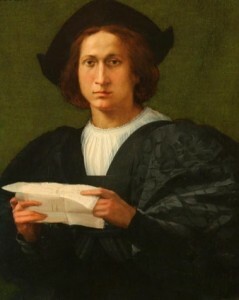 Costamagna, 1989 (1984–1985), 21, as Rosso, dated February 1519, related to Raphael’s Portrait of Lorenzo, Duke of Urbino, and the original source in Florence of portraits showing the sitter reading a letter, including the Portrait of Silvestro Aldobrandini in Minneapolis. Ciardi and Mugnaini, 1991, 84–85, no.13, with Fig., as Rosso, 1518. Berti, 1993, 182, as dated 1518, and Sartesque. Franklin, 1994, 212–216, 221–222, 316, Pl. 170, noted in the caption of Pl. 170 as inscribed: “Die XXII (?) 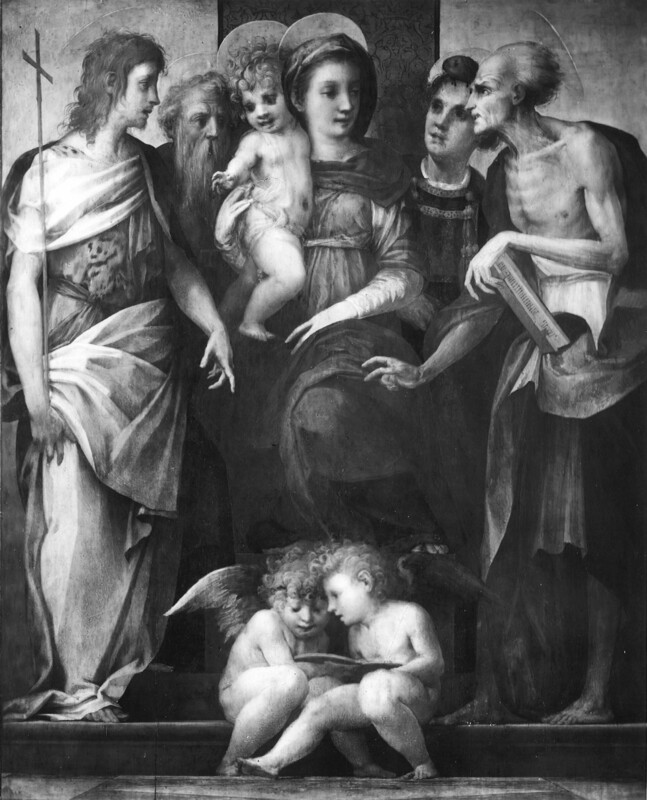 Iunii 1518 (and with other less legible words including possibly Rosso’s signature),” and that the letter and the glance of the sitter at the viewer are common motifs in Florentine portraiture, with reference to Ridolfo Ghirlandaio’s Portrait of an Aldobrandini in the Minneapolis Museum of Art (Pl. 171). Valle, 1994, 61–63, Fig. 19, the letter dated 1518. Costamagna, 1994, 72, 73, Fig. 55, 195, under Cat. 57, 293, under Cat. A51, 306, under A78, as Rosso’s, dated February 1518 (Florentine calendar). 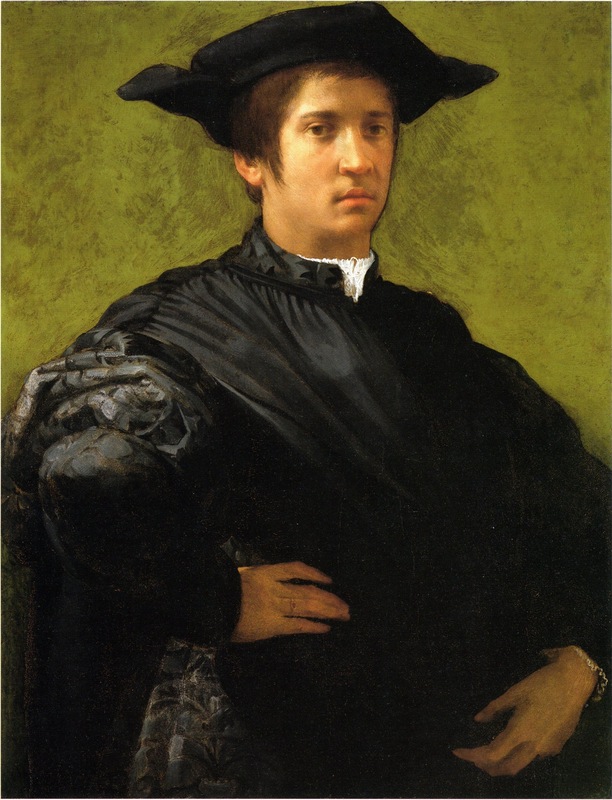 The portrait is very closely related to the signed portrait in Liverpool (Fig.P.16a) in the placement of the figure within the limits of the picture, in the handling of the large puffed sleeve, and in the angular description of the hands. 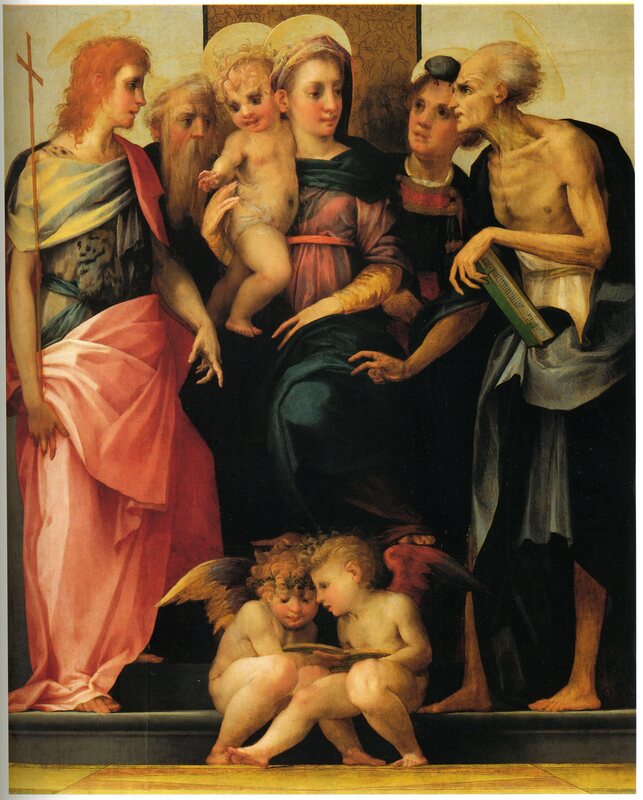 The loose brushwork of the head, hair, and hands is very much like that of these same parts of the figures in the S. Maria Nuova Altarpiece of 1518 (Fig.P.5a; Fig.P.5b). 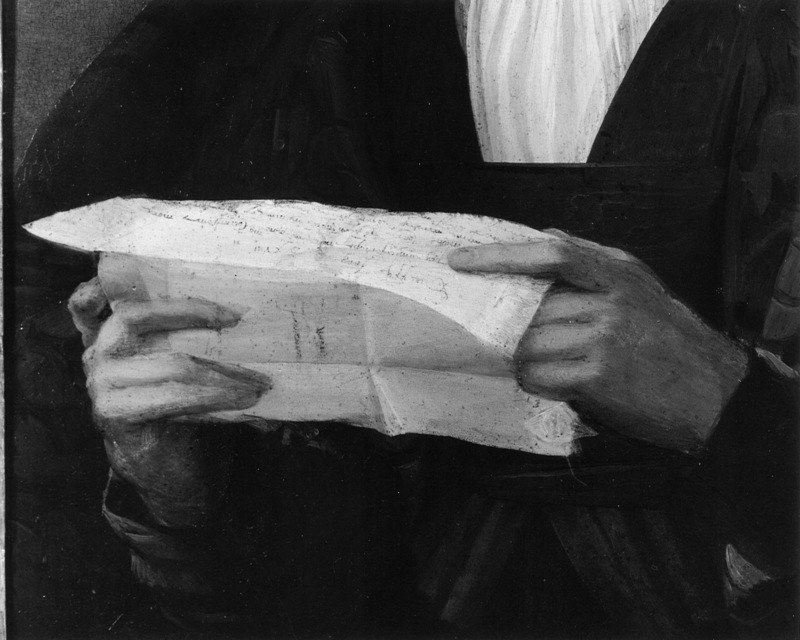 Furthermore, the size of the forms are more like those in this altarpiece than in the later Liverpool picture confirming that the date on the letter in the portrait also indicates the date of the picture itself. Thus it was done at the beginning of 1519 by modern reckoning, according to Gino Corti’s reading of the month as: Febij. Interpretations of this portrait might take into account Kristeller’s indications of letter writing in the Renaissance as a branch of literature and its widespread preference as a literary form (Paul Oskar Kristeller, “The Moral Thought of Renaissance Humanism,” Chapters in Western Civilization, I, 3rd ed., New York, 1961, reprinted in Renaissance Thought in the Arts, Princeton, 1980, 20–68). 1As read by Gino Corti from a large photograph of the letter (Fig.P.6c; Fig.P.6d).